A lively, passionate argument for the backyard vegetable garden, drawing on science, history, and stories from the author's garden. Our parents saw supermarkets and processed foods as the height of convenience. But nothing is more convenient than grocery shopping in the backyard. A vegetable garden offers the best defense against rising food prices, the most environmentally sound way to eat, and better exercise than any gym. It will turn anyone into a wonderful cook, since nothing tastes more vibrant than homegrown. And it can take less time every week than a trip to the supermarket. 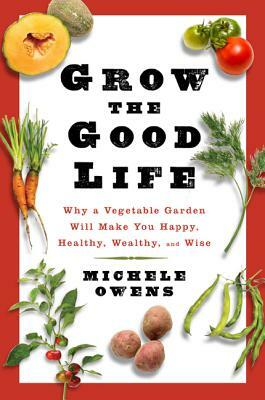 In Grow the Good Life, Michele Owens, an amateur gardener for almost two decades, makes an entertaining and persuasive case for vegetable gardens. She starts with two simple but radical ideas: Growing food on a small scale is easy, and it is absurdly rewarding. With her wry, funny, and accessible approach, Owens helps beginning gardeners overcome obstacles that keep them from planting a few seedlings every spring. She explains why dirt isn't dirty; the health benefits of growing one's own food; and that vegetable gardens are not antithetical to the frantic pace of modern life, but simple and undemanding if intelligently managed. Grow the Good Life is not just another how-to. Instead, it will teach you the true fundamentals of vegetable growing: how to fit a garden into your life and why it's worth the trouble. Michele Owens is a cofounder of Garden Rant, one of the most popular and influential gardening blogs. Her articles about gardening have appeared in O, The Oprah Magazine and Organic Gardening. She lives in Saratoga Springs and Salem, NY.